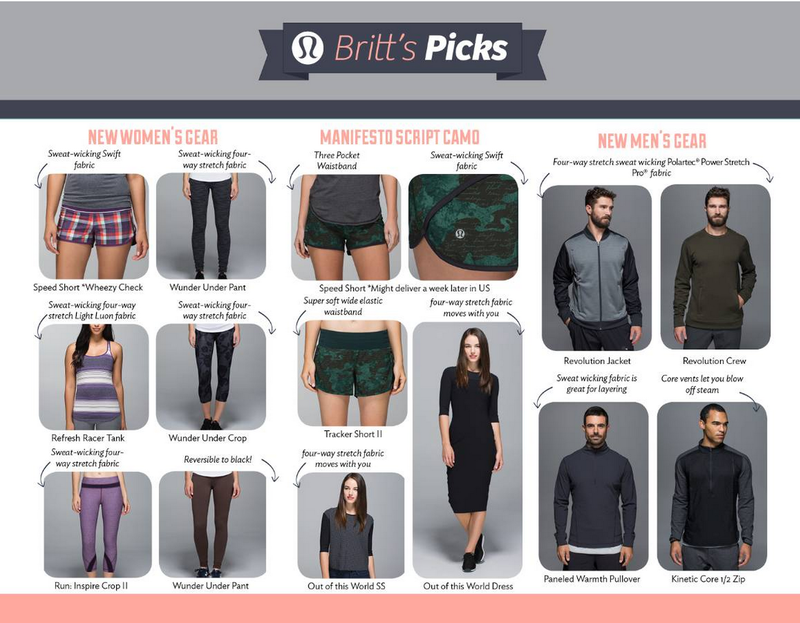 Another edition of Britt’s Picks for the coming week. I spot reversible Bark Wunder Unders at the very bottom! Love Bark! Osaka Stripe Refresher Racer Tank…now that is a bummer. Already we are not seeing many of these great colors and prints come in the Cool Racerback. I am returning the Going Grape Refresher Racer Tank today because it fits way snugger than CRB’s and looks odd with an Energy Bra underneath it. I may be interested in the Out Of This World Dress. "Run First Base Tank in Going Grape, Fuel Green Coco Pique Wunder Unders, Rocky Road Gusto Forme Jacket, Torque Tank, Long & Short Of It Jacket"